I always find January a bit of a weird month. On the one hand, you start off the new year pushed by your motivations and good resolutions, on the other hand it is extra hard to get back to work with a belly still full of christmas cookies and a mind still in holiday mood. Yet for most students in Leiden, work seems to be all there is in January. The library is bursting at the seams – we are in the middle of exam and paper writing period. Getting a bit stressed out is a normal part of the process, but I have the feeling for me, as for many students, study stress can sometimes be quite overwhelming. So what to do about that? While there are lots of things that help in the long-term, in a typically January-moment you might need to think about what you can do quickly to help you keep up and stay motivated. Here are some things that helped me in the past, and feel free to comment with your own best ideas. Create a good working atmosphere. When we are stressed, we often bring so many negative thoughts with us to start the working day. “I don’t have enough time”, “I can’t do this”, “I don’t like this specific subject”, …. It is not easy to get these voices out of our heads, but we can try to approach our work differently. Get a nice new notebook, put on some good music, dress in your favourite jumper, do whatever you need to make the things around you nice. My special tip: If you work at home, use oil fragrance burners! Candles always create a nice atmosphere, and the fragrance can help you studying: Rosemary for example is good for concentration, lemongrass for a good mood, lavender calms you down. I have seen cheap tea light burners at Dille&Kamille (Botermarkt 10 in Leiden). Distract your mind in between, but productively. To quickly check facebook and all your other social media feels like a great idea when you face a super tricky difficult problem in your studies, but it doesn’t help you getting on. When you feel stuck, rather distract yourself with something that allows your mind to process the things you have been struggling with. The best ideas come when you are not focused too hard on the problem itself, but are busy with something that gives your mind some free space to figure things out for you. Take a shower, go for a quick walk, do the dishes, try to do a headstand. 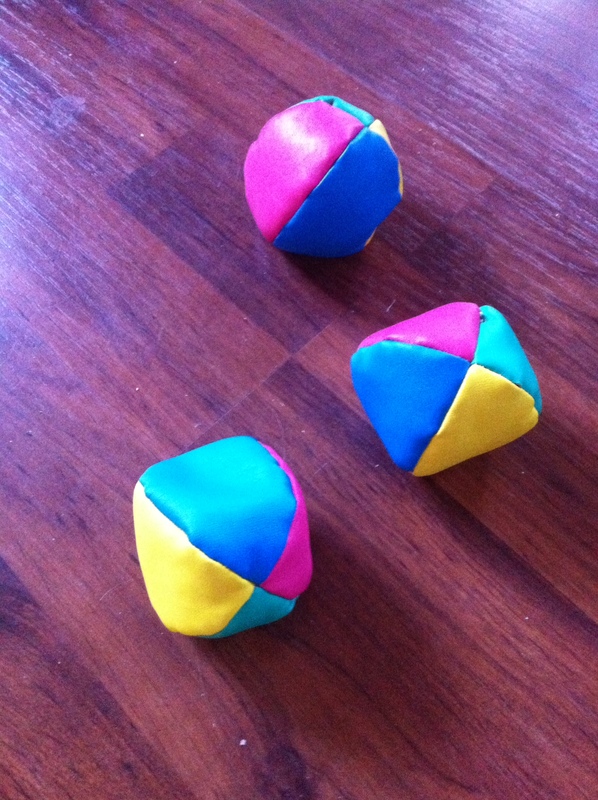 My latest discovery: Juggling! Not that I can do it really, not at all, but trying to juggle just for 3 or 5 minutes in between is really fun. You have a short feeling of success when you get the 3 balls around the first time (and then when you manage 2 times, 3 times, …) and you have to concentrate on something else for a moment. Also it wakes you up and gets you moving a bit, and apparently it’s a great exercise for your brain! I have to admit, my automatic first aid for study stress is still: chocolate and coffee. For some reason something inside me is convinced that if I only have enough of that, I will be awake and happy enough to be able to study all day and night. The reality is, too much of both makes me feel sleepy or sick or lazy. Better options: grapes for quick energy boost without sugar rush, ginger lemon tea to feel active and awake (also great when you feel a cold coming up), nuts for super brain power energy. I am sure you know many more things that will actually make you feel good and are not impostors like sugar and caffeine. 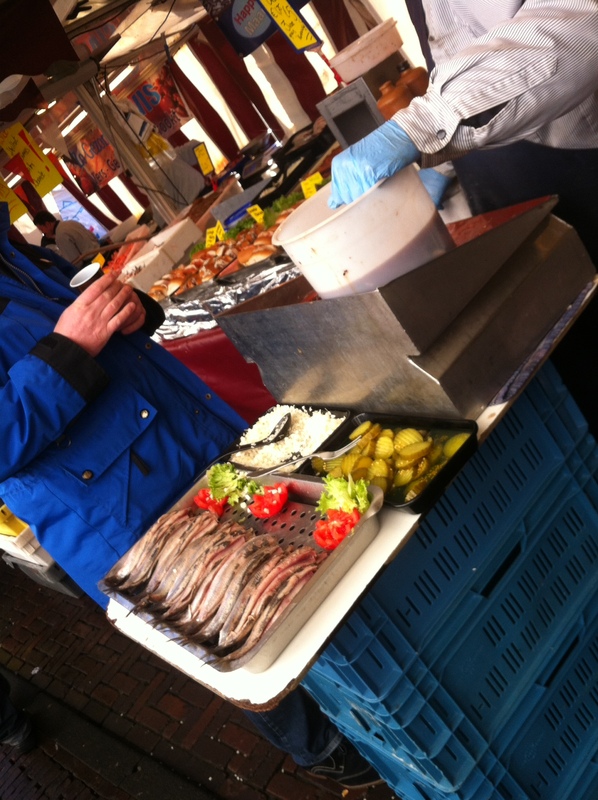 Apparently herring has lots of omega-3-brain-power-stuff, so why not go Dutch next saturday on the market and have a broodje haring for lunch? Write that frustration out of your mind. This might not be something for everyone, but it helps me and maybe you want to give it a try. When I have to write a paper and I am totally stuck and frustrated, I open a second document and just write all my anger, frustration or fear of not being able to do this down. I imagine when all the “rubbish” is on that paper, there is more space in my head for productive thinking again. And at the end of the day or of the project, you can just delete that rubbish-document. Relaxing is of course the most difficult thing when you feel overwhelmed by stress, and yet it is the most important. 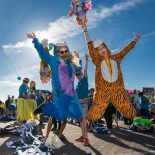 On the long-term, sport and meditation can help you having a more relaxed foundation, but there are also lots of quick things to do when you are in a stressful situation. Just holding on for two minutes and focussing on your breath and becoming aware of possible tensions in your body can make you feel better instantly. Loosening your shoulders or shaking your hands in between, having a nice cup of tea and staring out of the window for a bit, laughing with a friend about something silly, or doing some guided relaxation exercises (the internet has lots of free stuff to offer) before or after work can really help a lot. Remember, the more you feel stressed, the more important it is to consciously create a feeling of relaxation even just for a moment in between. Last but not least, don’t forget: you are allowed to have fun while working hard! Good luck everyone with your exams and papers, and: enjoy! 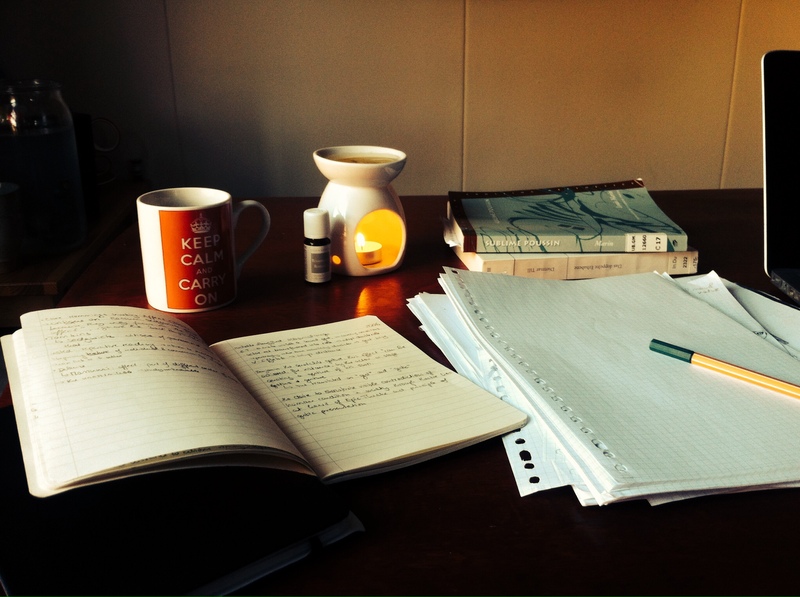 This entry was posted on January 11, 2014 by admin@theleidener in Anna Frederike, Study and tagged anti-stress, better concentration, Exam Period, relaxing, writing papers.